It is very exciting that now medical doctors and PhD scientists are now documenting ALS reversals. Two scientific articles have recently been published. 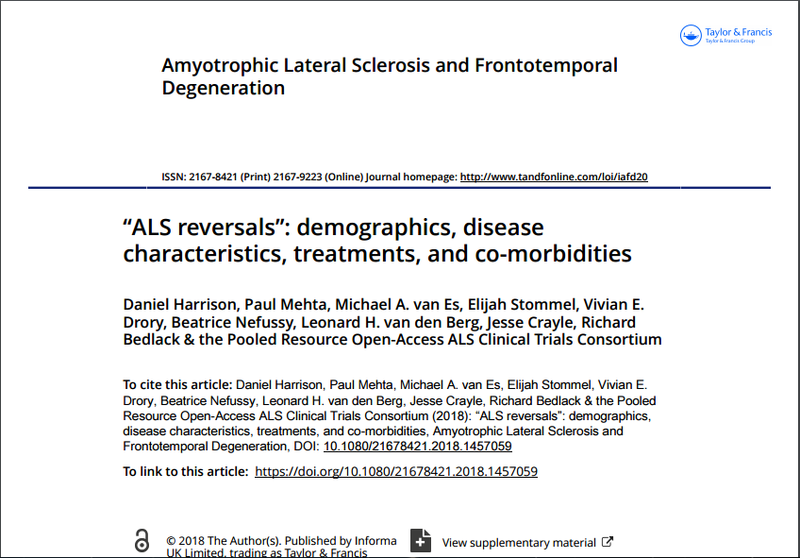 These articles prove that ALS is reversible. There is not one single way to reverse ALS, but there are some good places to start. Besides seeing a holistic medical professional, sites like HealingALS.org (the April 2016 blog, other blogs, Healed/Healing PALS and the home page below the video), shackel.org, alswinners.com and ericiswinning.org are good places to begin your research on how you can slow, stop and even reverse the progression of ALS. Complement Med Res. 2017;24(3):175-181. doi: 10.1159/000477397. Epub 2017 Jun 12. [Healing of Amyotrophic Lateral Sclerosis: A Case Report]. 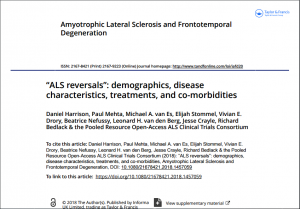 Mangelsdorf I, Walach H, Mutter J.
Amyotrophic lateral sclerosis (ALS) is a devastating disease leading to death within 3-5 years in most cases. New approaches to treating this disease are needed. Here, we report a successful therapy. In a 49-year-old male patient suffering from muscle weakness and fasciculations, progressive muscular atrophy, a variant of ALS, was diagnosed after extensive examinations ruling out other diseases. Due to supposed mercury exposure from residual amalgam, the patient’s teeth were restored. Then, the patient received sodium 2,3-dimercaptopropanesulfate (DMPS; overall 86 × 250 mg in 3 years) in combination with α-lipoic acid and followed by selenium. In addition, he took vitamins and micronutrients and kept a vegetarian diet. The excretion of metals was monitored in the urine. The success of the therapy was followed by scoring muscle weakness and fasciculations and finally by electromyography (EMG) of the affected muscles. First improvements occurred after the dental restorations. Two months after starting therapy with DMPS, the mercurylevel in the urine was increased (248.4 µg/g creatinine). After 1.5 years, EMG confirmed the absence of typical signs of ALS. In the course of 3 years, the patient recovered completely. The therapy described here is a promising approach to treating some kinds of motor neuron disease and merits further evaluation in rigorous trials. © 2017 The Author(s). Published by S. Karger GmbH, Freiburg.